Smartphones based on the Symbian (Nokia 7650/3650/9210/9210i, SonyEricsson P800), PalmOS (Handspring PDAs, e.g. Treo 600) and WindowsCE (e.g. O2-Smartphone or Qtek 1010) are pretty widespread, but devices working under the real pocket-type OS from Microsoft are not that popular yet and there are not many reviews of them even on the Net (as you know, the WindowsCE was originally written for a usual PDA and only after that was optimized for PCs with integrated GSM/CDMA modules). Today we've got the i-Mate, the first device in the form-factor of an ordinary cell phone that works under the Windows. This model is not big (120.4x50.1x23.5 mm) and pretty light (130 g, without a memory card). The display takes half of the front surface (it's a transreflective matrix of 176x220 pixels). Under the screen is a 5-way joystick, 2 soft keys, call and cancel keys, Today key, return key, and 12 keys typical of any other phone. Over the display you can find a speaker and a small LED that blinks at different frequencies depending on a situation (similar to Ericsson's phones). 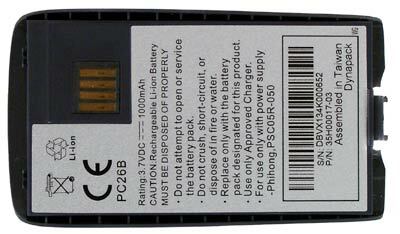 Three frequency bands is another i-Mate's feature that unites it with Ericsson (GSM 900/1800/1900). The top panel houses only an IR port, which is so big that many notebook PCs would envy it :-). The left side has a lot of various controls. The on/off & profile button is above. Under it is a recorder button. Then comes a volume control swing button, and, finally, an SD/MMC card slot. On the right you can find only a hands-free jack which also serves as a stereo headphones one. Unfortunately, no other headphones can be hooked up. An interface connector and a microphone can be found underneath. On the back it has an external antenna jack (with a protection cover), Microsoft Windows Powered logo and a battery fastener. Two hooks above and a latch below reliably fix the battery. Its capacity is 1000 mAh, which must be sufficient for two days at the average intensity of usage (about two hours a day, music listening through headphones, 30-40 minutes for an organizer and 15-20 minutes of talking (not in the speakerphone mode). To switch it on you must press and hold the button on the left side above. I can't say it boots up in no time: it takes twice more time for it to start as compared to an ordinary cell phone, but in comparison with its direct competitors (Symbian based models) the i-Mate wins 2-3 seconds. All icons and principles won't be new for those who are familiar with the WindowsCE. The only distinguishing feature is a nonstandard display resolution and its insensitivity, but one would quickly get used to it. Besides, it's better to use a keypad and usual buttons than a stylus in case of smartphones. When the device is booted, you will see the Today window. The display is divided into 8 straps. The upper section is used for various system signs: a signal level, a battery status (4 points), unread SMS/MMS/E-mail messages and unanswered calls. Well, all the functions are standard so far. Below are 6 recent applications (it's similar to all PocketPCs). Under it is the network operator's name and current time. The next field displays upcoming appointments, reminders and the number of unanswered calls. Then you have bookmarks for frequently visited WEB or WAP pages. The link actually brings you to the i-Mate info page though you can also change the links. Below is the information on the number of unread SMS, MMS and email messages. The last field indicates the current profile, and the line underneath indicates shows of the soft keys. The right soft key can be taken for any application, while the left one is dedicated for the Programs menu. The menu (in case of the middle-size fond which we find the most optimal) consists of 9 items: 8 programs and a transition to the next list of programs. Each of the items is tied to a figure which corresponds to its sequence number, i.e. the joystick is actually unnecessary. Now let's me dwell upon the software that you can find in the menu items (you can use 12.53 MB out of 16 MB memory). Inbox/SMS. This program allows to work with various messages. But it does have some downsides, and one of them is that you can't use more than one account. If you need to check only one mailbox, it's ok, but if you have two or more, you must look for an alternative program. Secondly, all messages (e-mail, SMS or MMS) are brought into a single list though the icons are different. I can't say it's a big problem, but still, it's not very convenient to look for an SMS received a couple of days ago in the endless list of e-mail messages. Contacts. This menu item is standard. The number of entries is not limited, and the number of fields is equal to that in the Outlook. I have no complaints about this utility. Calendar. Here you can look though the list of events for a certain day, week, month etc. 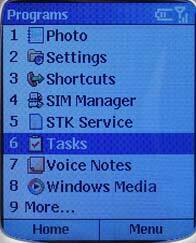 There are all necessary features like in the WindowsCE. Internet Explorer. Web & WAP browser. There can be problems with heavy graphic pages, but it's rather because of the resolution than of the viewer (handy.ixbt.com looks pretty well :-)). 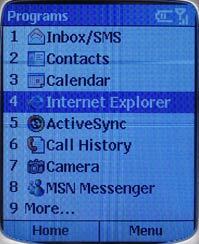 ActiveSync. PC synchronization program. You can use a USB cable supplied (like in case of PocketPCs) or the IR port. Unfortunately, there is no BlueTooth and you can't use wireless headset. If you have the ActiveSync 3.6 on your desktop PC, no additional software is needed. i-Mate is detected at once, and no sync problem occur. However, you can't automatically synchronize files in My Documents folder on the PDA (but you can handle them from the explorer). MSN Messenger. Instant message exchange system. The client is integrated into all PocketPC 2002 based PDAs and into the distributive of the Windows XP. After the Internet connection was set up, I had no problems with MSN services. You can type them on a keypad like usual SMS. I haven't seen an ICQ version for this OS yet, but even after dealing with the MSN you can't help thinking about SMS passing away. The Internet pagers are much cheaper :-). Photo. Graphics information viewer. No problems with jpeg and gif files, but it's impossible to open a photo made with a 4MP camera. On the other hand, it takes just several seconds to open a subway map in the gif format. Settings. Here you can find a wide variety of settings starting from a signal type to the Internet connection. Shortcuts. In this menu you can handle shortcuts. SIM Manager. You can copy records to or from the address book stored on the SIM card. STK Service. SIM Application Tool Kit. The services in this menu entirely depend on your operator. Tasks. All features are standard. Windows Media. This is a multimedia player. I wouldn't recommend watching video, but still, you can boast of what your i-Mate is able of. Nonetheless, it perfectly plays music. The device easily deals with all compositions scattered about the memory card and you don't need to record it in a separate folder. We tried mp3 and wma. No problems were noticed. The only flaw is that it has problems with cyrrilic letters in id3 tags in mp3 files (no such in wma). No problems with bitrates, be it 320 kbps or 16 kbps. By the way, the volume level of the i-Mate is much higher that that of its competitors. The Camera application is created for operation with an external camera which sells separately. We don't have it, so we have nothing to say about photo quality or its usability. I should note that I couldn't find an explorer among integrated applications, as well as Word and Excel (not to mention the Access). It's very strange because Microsoft is renowned for its All-in-One solutions. I hope it will soon change for better. By the way, the Net currently offers few programs for this platform, and they are mostly games. But I think the number and variety of software will quickly grow up. So, if a PDA means a handy organizer, electronic library and mail in one you should definitely have a look at smartphones. Fortunately, some of them (like Nokia 3650/7650) are not dearer than a tandem of a budget phone with GPRS and an inexpensive PDA. The smartphone reviewed is not cheap (about $900), but if you are an absolute fan of the WindowsCE, the i-Mate is the only possible solution for you.